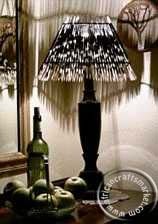 A beautiful African handcrafted lamp shade that has been crafted with genuine African porcupine quills. The Porcupine quill lamp shade comprises of 120 thick quills that are 25 cm in length and is set is a Pyramid shape with 4 sides that taper in from a larger base to a smaller top. This African lamp shade makes for an excellent lamp shade and the contrasting color of black and white go well with any style of room. For an African theme room these have become #1 choice of African interior designers and will be found in many 5 star Game reserves around Africa. This porcupine lamp shades has been crafted in South Africa and originates from Cape Town. The lamp shade does not include the light stand. Each African porcupine lamp shade is an "original" work of art, individually hand picked, no two are exactly alike which adds to the value of each piece. 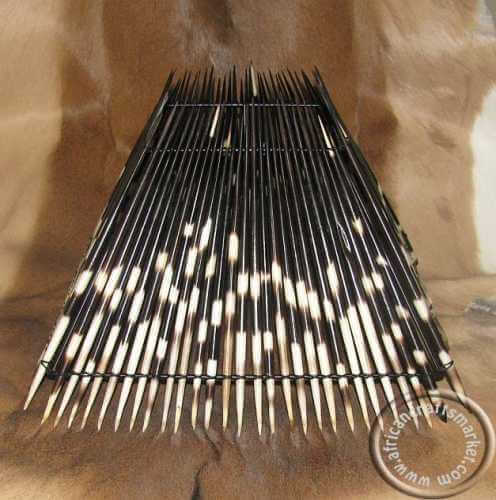 The original nature of porcupine quills will be reflected by variances from the lamp shade as shown, each piece of a specific style is similar, but not identical.